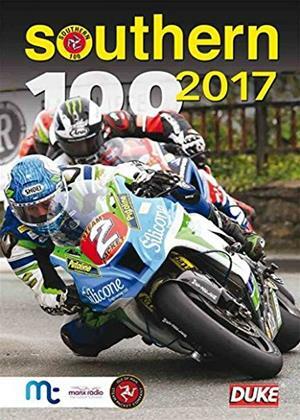 You can't judge a road race by the length of a lap if you could the Southern 100 would be massively overshadowed by the Isle of Man's other race. As it is the 4.25 mile Billown Course, home to the Friendly Races, punches well above its weight, attracting top name from across the solo and sidecar racing world. 2017 saw a line-up of road racing royalty that, quite rightly, had fans in a state of great excitement even before the first wheel had turned. Once the action got underway the crowd quickly saw huge anticipation wouldn't lead to disappointment: Michael Dunlop, Dean Harrison, Dan Kneen, the Birchall Brothers, Tim Reeves, John Holden, Dave Molyneux and many more saw to that. As the headline had it: Four races, four winners, four lap records and four race records! well, the good news is you ll see more than four races on this superb review of the best of the action. Filmed from multiple camera points around the course, and from on board cameras too, the review packs in almost as much high energy, super close, competitive racing as you can handle, but be warned: You will be left wanting more of the same: road racing this good is highly addictive!